Running a one-night game of Vampire: The Requiem? Wanting to start up a new chronicle, but your players aren’t sure what to play? Looking for a fast way to dive into one of White Wolf’s SAS adventures? 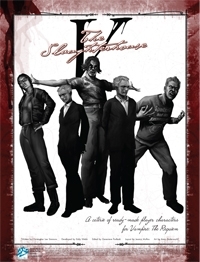 This PDF details “The Slaughterhouse Five,” a coterie of player characters designed for instant use in your Vampire game. • Storyteller advice for the group, as well as links to established SAS adventures, such as Criminal Intent. This title was added to our catalog on June 10, 2009.